As Calgary’s first community with man-made lakes, Lake Bonavista is a popular community with its many recreational opportunities. The SW community was established in 1967 and has shopping, schools and year-round outdoor and indoor activities. Lake Bonavista real estate has many beautiful single-family homes (many that back onto the lakes) and also a few condo complexes. View all homes for sale in Lake Bonavista here, and read more about Lake Bonavista real estate below. Lake Bonavista is a large community in SE Calgary that surrounds a lake. Lake Bonavista is Canada’s first community to be built around man-made lakes. There are two lakes in the community – Lake Bonavista is a bigger lake with access for the entire community and Lake Bonaventure is a smaller lake in the southern half of the neighbourhood. Access to Lake Bonaventure is only for residents who live right along the lake’s shores. The SE community is bound on the northern side by Anderson Road, south side by Canyon Meadows Drive and on the western border by Macleod Trail. Two main roads run through the community – Bonaventure Drive and Acadia Drive. Directly to the east of Lake Bonavista is the community of Bonavista Downs, and Willow Park is to the north and Parkland is to the south. Lake Bonavista residents can enjoy summertime and wintertime activities on Lake Bonavista and Lake Bonaventure, including swimming, skating and paddling. There are beaches and parks, including areas that can be reserved for large groups. 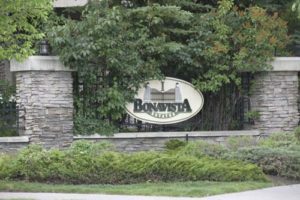 Lake Bonavista is managed by a homeowners’ association and organizes public events throughout the year. With quick access to Macleod Trail and the Calgary Transit Canyon Meadows LRT station, commutes throughout the city are very quick. There are also many buses that run through the community. Lake Bonavista is home to two shopping strips and many schools. There are more shopping centres, restaurants and services all along Macleod Trail. The community association runs a recreation centre with ice rinks, gym, fitness centre and meeting rooms. Contact us anytime for more information on Lake Bonavista real estate.